Books of May highlights books - both fiction and non-fiction - that have engaged, entertained or otherwise made a significant impact on me over the years. I aimed to review 31 books in May 2013, and managed to get through nine. Hopefully we'll go better this year. 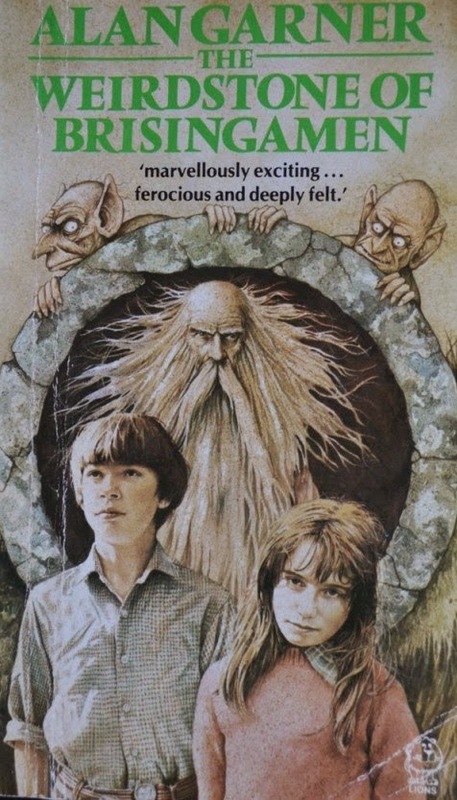 Today, book #10: The Weirdstone of Brisingamen, by British author Alan Garner. Is it just me, or has the science fiction and fantasy establishment completely forgotten about Alan Garner. To my mind he's one of the giants of children's fantasy. While I'm highlighting his 1960 debut novel here, I could just have easily picked its sequel The Moon of Gomrath, or Elidor, or The Owl Service, or even Red Shift. He tells such beautifully constructed stories that are generally immersed in the folklore and culture of his native Cheshire. He's been writing them for more than 50 years: eight novels, a bunch of short story collections, all demonstrating the same strength of narrative and a beautiful turn of phrase. Go to the average science fiction convention, however, and it's like you can hear crickets. People still go on and on ad nauseum about J.R.R. Tolkien, and the likes of Ursula LeGuin and Diana Wynne Jones both get a healthy amount of discussion. Garner, however, seems like a shadow: a major figure in British fantasy who's all but ignored by the fans. More educated fans can probably say better than I can, but I'm pretty sure he's never been a Guest of Honour at a Worldcon or a World Fantasy Convention, or even a British natcon (Eastercon). He's already 79 years old - if fans plan to give Garner the respect he's due, they're probably running out of time. The Weirdstone of Brisingamen is the first part of a trilogy. The Moon of Gomrath followed in 1963. The third part, Boneland, had to wait until 2012 (for all its quality, Garner himself is not a huge fan of Brisingamen and claims not to particularly like its protagonists). Twins Susan and Colin have a holiday in Cheshire. Susan's mother gives her a jewelled bracelet that's been in the family for years. It turns out the jewel is of certain mythic significance, and before long Susan and Colin are on the run from dark spirits, a witch and an wizard all clawing to get their hands upon it. I loved this novel as a child. A few years ago HarperCollins reprinted the book as a hardcover anniversary edition, and that gave me a chance to rediscover it as an adult. It's a bit dated, certainly, but then it's also more than 50 years old - it's allowed to date a little. What impressed me as an adult was its strong sense of place and geography. It's a mythic fantasy, but one that feels grounded in something real, and ancient. Since its original publication Brisingamen has been a stage musical as well as a rather effective 2011 radio drama adaptation from the BBC. Obviously it's too late for the musical (apparently copyright issues have meant it can't be remounted), but the radio play is certainly worth tracking down. Alan Garner strikes me as well overdue for a reappraisal and a popular renaissance. I think there's no better place to start that than with this book. I love this book. I read it as a primary school kid and had such a strong memory of it as an adult that I searched for it in evry 2nd hand bookshop I came across until I found it a couple of years ago. I haven't read it again, yet-- just owning it was enough-- but I might have to pull it out and sit down with it on a rainy day soon. I've been slowly scouring Melbourne's op shops to restore my entire childhood library, much of which was lost, given away, donated to my sister to use in teaching, etc. I've got one volume each to track down of Lloyd Alexander's Chronicles of Prydain and Susan Cooper's The Dark is Rising. Star Trek: The Next Generation: "Time Squared"
Star Trek Enterprise: "Doctor's Orders"
Star Trek: The Next Generation: "The Royale"
Star Trek: The Next Generation: "Contagion"
Star Trek: The Next Generation: "The Dauphin"